It’s summer time and with summer comes grilling and smoking outdoors. In fact, early next month at our Lark Inn in Cottonwood Falls, we will begin our series of grilling classes. CLICK HERE to learn more. Many of you may know that when our daughter was married a couple of years back, my husband and I cooked meals for all the guests during the week prior to the wedding as well as a dinner and brunch for about 100 of the wedding guests. This recipe is for a smoked brisket we did for the rehearsal dinner and it was truly to die for! After a lot of trial and error we finally found the best blend of spices, flavorings and cooking technique. 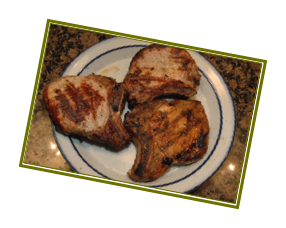 Since Grilling and smoking is Pat’s department, I am having him share his recipe with you. You can go one of two directions with the brisket; if you buy the brisket flats, you will have very little trimming to do. But, if you buy the full briskets, you will have some fat to be trimmed. If you are starting with a full brisket, start with it laying flat with the fat side up (isn’t that was some of us do when we lay flat on our backs?!?!) Press around on the fat and find the hard nuggets of fat. You will have to trim these off because they will not render down during the cooking process. Be sure to leave about ¼ inch of fat over the entire brisket. The fat is needed to help keep the brisket moist during cooking. Next you will need to trim the fat along the sides between the flat and the point. There is also a line of fat between the point and flat which also needs to be trimmed. You will notice that one end of the brisket is thicker than the other. This thicker end is the point and the other is the flat. I recommend that you separate the point from the flat. This way the two will be similar in thickness and consequently, they will cook in the same amount of time. Follow the directions on the French’s Au Jus package EXCEPT use the beef broth instead of water. Mix all the rest of the ingredients and simmer for 15 minutes. 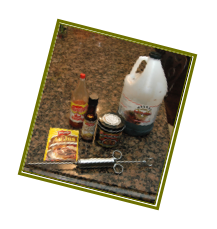 Tip: to create the bacon grease, I fried up some bacon ends and pieces which were less expensive than bacon and fattier . . . it is the fat that we are after. You can also use the cooked bacon for Kris’ Cowboy Beans. I use Adkins Rub from Texas for my rub. Liberally apply the rub over all of the surfaces of the brisket taking care to rub it into all the cracks and crevices. 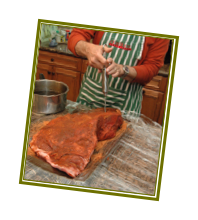 After the rub is applied, inject the warm marinade into the brisket with the fat side up. You will want to insert the needle as far into the meat as you can with out punching through the other side. Injections should be make about every 1 – 1-1/2 inches over the entire surface of the brisket. 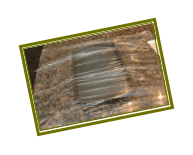 Tip: I use a baking pan with low sides (large enough for the brisket and lay plastic wrap over it extending the wrap past the edges of the pan by 10 or 12 inches each way and lay the brisket on top of the plastic before injecting. After injecting the brisket, wrap it up in the plastic wrap and but it in the refrigerator overnight. GOOD MORNING!! First things first, pour yourself a cup of coffee and go out to your smoker and stare at it until you wake up to figure out what you’re doing outside, staring at your smoker. 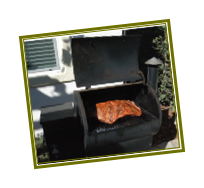 Now that you’re awake, start your smoker and set it to a temperature between 225° and 250°. If this is your first smoked brisket, I recommend that you use equal amounts of oak and hickory for smoking wood. Mesquite has a wonderful flavor, but it is easy to over smoke with mesquite and cause the meat acquire a bitter taste . . . especially when you are smoking something for this long of a period of time. Place the brisket on the grate of your smoker, fat side up. If you have more than one grate in your smoker, place the brisket on the upper one so you can put a disposable foil pan below it to catch the drippings. Be sure the pan is large enough to hold the brisket. We will add these dripping to the au jus sauce later. Smoke the brisket for four hours and toward the end of that time frame you will want to pre heat your oven to 225°. Remove the brisket from the smoker then place it fat side down in the pan and add enough of the au jus sauce to make it ¼ of an inch deep. Be sure to simmer the au jus before putting it in the pan. Now, cover the pan with foil and put it in your oven and cook for another 6 – 7 hours. I recommend that every hour or so, you pull the foil back and use the au us sauce as your mop sauce to keep the brisket moist. I use a basting brush or a turkey baster will also work well. 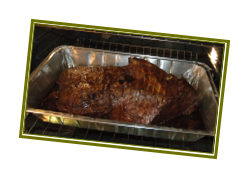 At 225 – 250° it takes brisket .8 – 1.5 hours per pound. Because of the kind of cut of meat brisket is, you don’t just cook it to a specific temperature and you’re done. It’s a bit more subjective than that. 190° is a good guideline, but what you are really after is tenderness. Once your temperature probe slides into the meat easily, then you are on your way. Try a fork, when the meat is “fork tender” you have arrived at your destination! Take the meat out of the oven, uncover it and let it rest for at least 30 minutes. If you push this time and don’t allow the meat to rest, the minute you cut into it all the juices you just took 10 – 15 hours putting in there and preserving will run out of the meat and life as you once knew it will cease to exist! Well, maybe it won’t be quite that bad but your brisket will lose a lot of it’s moisture and could tend to be pretty dry. STEP AWAY FROM THE BRISKET! After the meat has rested, remove it from the pan and place it on a cutting board. Remove any remaining fat and turn the brisket over and start slicing. Be sure that you are slicing the meat perpendicular to the grain. This will result in more tender slices. Normally, you should slice the brisket ¼ inch thick. If it is a little tough though, you will want to slice it thinner and if it is falling apart, thicker slices will help it to stay together better. After the brisket is sliced, strain the au jus and either drag the slices through it or simply pour it over the meat. I don’t use the barbeque sauce in the cooking . . . especially for large groups. Some of your guests may like it and others may not. So I just leave it up to them if and how much they want on their food. Now the moment you have been waiting for ENJOY!! As always, thank you for reading! Please forward the link to this blog to anyone you think would enjoy it!